Welcome! I'm a wedding photographer based in Grand Rapids, Michigan and I thrive on crafting spectacular images full of depth, drama, and romance, as well as capturing beautiful moments of love, joy, and laughter that you'll cherish forever. My tools are light, shadow, and perspective and my ultimate goal is to tell the story of your wedding with compelling photographs that transport you back to the wonder of that day every time you open the pages of your album. Below is a selection of my "signature images" - these are the photos that best exemplify my style of wedding photography -beautifully dramatic images with gorgeous lighting and creative compositions that look like they could be scenes from a Hollywood film. Photographs that showcase your love and highlight the excitement and grandeur of your wedding day. If these images resonate with you, I would probably be a great fit for your wedding. Fill out the contact form below to find out if I'm available for your date and get the conversation started. I would love to create striking artwork for you that you'll be proud to hang on your walls! While my style is really epitomized in epic portraits like these, I strive to achieve a similar look in all the photos that I take throughout a wedding, using my knowledge of lighting and composition to create images with depth and drama even during the candid portions of the day. Have a look at my full portfolio to get a more complete overview of my work. I love creating epic portraits, but a single image could never tell the full story of your wedding day. 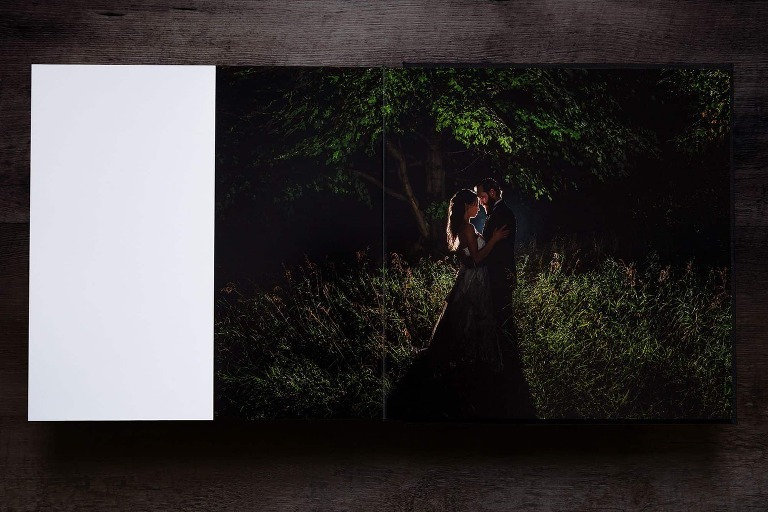 The wedding album is where individual photographs from throughout the day come together to tell a cohesive story, one that flows smoothly from one page to the next in an elegant rhythm. All of my collections include digital files, yes - but a folder of jpegs is not a finished product. It's more like the raw footage from a motion picture before it's been cut and spliced together into the scenes that make up the film. Everything is there, but there's no focus, no pacing, no emphasis to direct your attention to the most important moments. It requires the touch of a skilled editor to weave all the separate shots into powerful scenes that convey the drama and emotional impact of the overarching narrative. An album is made up of "spreads," the two-page layouts that you see when you have the book opened up in front of you, laying flat. Each spread is like a scene from a film, telling a story all its own. The shots are carefully chosen to harmonize with each other in mood and style and presented in a clean, elegant layout that draws your eye and your attention to the key moments and images. Just like the scenes of the movie, all the different spreads with their individual stories combine to tell the much larger story of your entire wedding day. The result is a stunning work of art that is truly greater than the sum of its parts. The wedding album is the true finished product that I will provide for you. It's a real, physical manifestation of your story that you can touch and feel as you drink in the beautiful images. You become absorbed in the emotions on each page as you relive the excitement and romance of your wedding day all over again. Years from now, you'll sit down on the couch with your kids and turn through the pages, watching their reactions as they experience your wedding for the first time. And decades into the future, when no one even remembers what a jpeg was, your great-grandchildren will be able to pull your album off the shelf, dust it off, and get a glimpse of who you were and how much you loved each other. A physical, printed album is the best possible way to enjoy your photographs and preserve the legacy of your wedding. I believe this so strongly that I have committed to delivering a custom designed album to everyone that hires me, as well as providing full day coverage in all of my collections, to ensure that every couple gets the very best I have to offer. It's an honor to be entrusted with crafting this timeless heirloom for you. Look through the gallery above to get an idea of what my albums are like. I would love to show you some samples in person as well, so fill out the contact form to get in touch and schedule a consultation. In order to tell the complete story of your wedding day in my signature cinematic style, I have found that it's better to not limit you to a set number of hours of photo coverage. Limiting wedding coverage to a specific number of hours usually results in trying to do too much in too short a time frame, and prevents me from producing my best work during each part of the day. Of course, the ceremony is photographed in real time and has a fixed duration, but the bride and groom getting ready, photos of the dress and other details, separate bride and groom portraits, first look (if you're doing one), family portraits, photos with the wedding party, creative bride and groom portraits, and reception detail photographs - these are the areas where spending more time really pays off in terms of the quality and variety of the photographs. I want you to have the best images that I am capable of creating, and an amazing wedding album that flows smoothly from one exquisite layout to the next while doing full justice to each part of the story. To make that a reality, I include full day coverage in all of my wedding collections, so that these portions of the day are given as much time as necessary based on your needs, preferences, and the locations involved, with no limit on the number of hours. Full day coverage means you'll never need to worry about whether you'll have to pay for more hours to get beautiful sunset photos at your June wedding. You won't have to schedule all the events at your reception one right after the other, just to fit them in before I pack up and go home. You won't have to make a choice between having me start earlier to create stunning bridal portraits, or stay later to capture the excitement of your sparkler exit - I'll be there for both. And we'll have plenty of time in between to capture all the magic of the best day of your life.